1. In a medium size mixing bowl combine all ingredients and chill. 1. In a medium size mixing bowl combine all of the ingredients and chill. 1. Bring oil in a deep fryer to 375 degrees Fahrenheit. Slowly add in the potato slices a few at a time and allow to brown on both sides evenly. You might have to move them around with a slotted spoon. When the chips are done remove to a paper blotter and allow oil residue to be removed. 2. When all chips are done cooking toss with Salt and a drizzle of the truffle oil. Reserve. 1. Bring oil in a deep fryer to 375 degrees Fahrenheit. 2. In a medium size mixing bowl combine the all-purpose flour, salt and pepper, and ale and mix well. The batter should not be too thick, it should coat the back of a soup. 3. Lightly dredge the fish filets in the flour and then dip into the beer batter. Completely cover the fish filets with the beer batter. Slowly dip the fish into the batter and swirl lightly until a small crust begins to form on the fish. 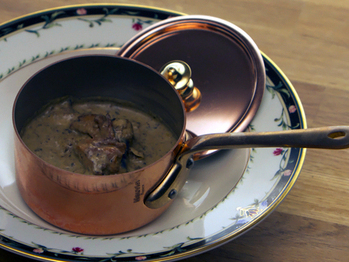 Release the fish into the oil and allow to cook for 7 – 9 minutes or until golden. Continue this process until all filets are cooked. Remove on to a paper blotter and reserve till plating. Lightly season filets with salt and pepper. 1. 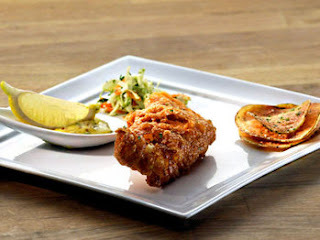 On 4 warm plates evenly distribute the Tartar Sauce, House-Made Slaw, Truffled Chips and Fish Filets. 2. Garnish with lemon wedges. Chef Kevin talks about his experience on the Bravo show, his restaurant and his plans for the future. Click here to learn more about The Pier Restaurant. This week on Rocco's Dinner Party, we had self-trained chefs Janet, Kevin, and Chris duke it out in the Signature Dish challenge. Kevin made a rather corporate shrimp and grits that Rocco nevertheless enjoyed. Janet produced a crepe filled with delicious pork belly, presented with a few bits of upsettingly textureless, Barbie doll-sized, kimchi. But the real sin was Chris' beurre blanc sauce, which broke and got the rather cocky lad sent home. The party theme this week was "gastropub," basically elevated British-style pub food. Janet is an Anglophile so she might have the advantage with decorating, but what Kevin lacked in decor imagination, he more than made up for with his six-course menu of pubbish favorites like fish and chips. The guests for this week's dinner are foodie Amanda Hesser, actor Christopher McDonald, chef Ken Oringer, So You Think You Can Dance presenter Cat Deeley, Frank Carfaro of home furnishings company DESIRON, and actress Raven Symoné. Raven doesn't eat red meat, so she throws a monkey wrench in the chefs plans. They recover well and manage to make various interesting substitutions for the pork, beef, and liver dishes on their menus. 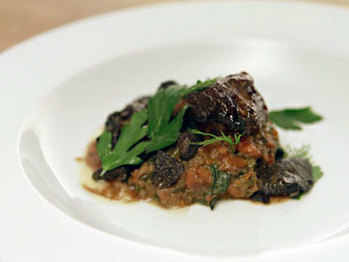 Because both chefs offer so many courses, this episode doesn't have the level of nit-picking that some others have had. For the most part, all dishes are successful apart from the desserts, and Kevin's pot pie which suffers from too much saffron. Both parties also seemed to be fun, so the decision must have been fairly hard for Rocco to make. In the end, the champagne gets handed to Kevin, who prepared a more successful meal overall. 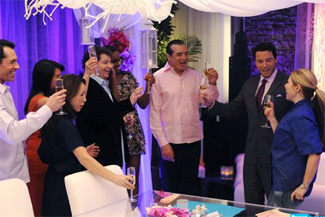 TC News and Information 7.25.11 - Confirmed: Season 9 Now Filming! Bravo confirmed Season 9 filming is underway in this post on its website Thursday (7/21) soliciting Quickfire Challenge suggestions (no indication of the deadline for submitting your ideas via twitter). While that item from Bravo’s The Dish remained elusive about the filming location, there’s not much room left for doubt that Season 9’s locale will be not be a single city – a la TC Chicago, TC D.C., TC Miami, etc. – but several cities in the State of Texas. A blog post by SymiGoddess titled “The Night Bravo Told Me to Stop Tweeting” got the rumor-mongering train started. Her tale of what happened when this avid TC fan and twitterer stopped in at San Antonio’s oldest bar and stumbled upon Tom Colicchio, Padma Lakshmi, Tre Wilcox, Emeril Lagasse, and, ahem, Gail Simmons the night of June 27 is quite a read. As usual, Eater.com has been all over the story, reporting that TC9 will include San Antonio, Dallas, Austin, and Houston. You can find a round-up of Eater’s reports and links to original sources here, including chefs rumored to be participating. Austin Culture Map has also confirmed that “Top Chef’s Producer and Assistant Producer bivouacked at the W Dallas the week of July 4th,” that TC alum and All-Star Casey Thompson was recently in town, and that the TC crew would be filming at Austin’s Driskill Hotel July 21. Here’s another location that sounds likely: There’s a branch of the Culinary Institute of America in San Antonio “set among cinematic 19th century buildings once part of the Pearl Brewery, and equipped with two state of the art studio kitchens wired for sound and taping,” according to ACM. Eater uncovered some convoluted allegations that Texas cities were asked to pony up money to serve as locations for the upcoming season. This item claims the Houston Convention and Visitor’s Bureau was approached last October to participate in a “nine-episode season, two episodes would be out of state (presumably the finale), one would be in Dallas, one in Austin, one in Houston, and the rest to be determined... all depending on who wanted to pay for the privilege.” In Eater's follow-up investigation, Houston, Dallas, and Austin organizations all denied providing outright cash – but confirmed they had indeed been approached to film Top Chef in their cities. Given the sponsorship and product-placement palooza TC is, I’m not surprised by these allegations. What does have me shaking my head is the idea of a Top Chef season with only seven episodes prior to the finale. Since that was reportedly from last October, I’m going to chalk it up as being part of preliminary overtures and remain highly skeptical that Top Chef Season 9 will run that short. Other than Seasons 1 and 2, despite varying numbers of contestants, each season has run 12 episodes excluding finale episodes. Bidding, which ended July 21, was to start at $5,000. A “buy it now” option of $15,000 was also offered. But Ebay is showing that no bids were tendered. Hmmm. Too pricey? Or too confidential even to disclose bids? In any case, Eater has somehow deduced that Restaurant Wars will be filming on July 26 and anticipates the location will be in Austin. Also on July 21, Pee-Wee Herman announced very publicly at Comic Con that he will be filming a Top Chef episode at the Alamo (in San Antonio), as in “getting on a plane” presumably shortly thereafter, according to attendees. Filming a Top Chef season typically takes 4-6 weeks (excluding the finale, which is filmed after a hiatus), and we’re already in that range. So, a 7-episode (plus finale) season in Texas? I don’t think so. My guess is that Bravo and the Magical Elves are looking “to go big or go home,” especially after the All-Stars season, and other than maybe an amuse-bouche Quickfire with a Texas twist, there won’t be anything “miniature” about Top Chef Texas. Are you looking forward to the next season of Top Chef? What do you think about it being filmed in Texas? Let us know in the comments. 1. In a large skillet, heat the oil. Season the ribs with salt and pepper and coat with the Wondra flour. Add them to the skillet and cook over high heat, searing on all sides until browned and crusty, about 18 minutes. Transfer the ribs to a cast iron Dutch oven in a single layer. 2. Add the onion, carrots, celery and garlic and habanero to the skillet and cook over low heat, stirring occasionally, until very soft and lightly browned, about 20 minutes. Add the wine, chicken stock and thyme sprigs and bring to a boil over high heat. Pour the hot marinade over the ribs. 3. Preheat the oven to 325degrees Fahrenheit. Cover the ribs and cook in the lower third of the oven for 2 hours, until the meat is tender but not falling apart. Uncover and braise for 1 more hour turning the ribs once or twice, until the sauce is reduced by about half and the meat is very tender. 4. Transfer the meat to a clean shallow baking dish, discarding the bones as they fall off. Strain the sauce into a heatproof measuring cup and skim off as much fat as possible. 5. Heat the sauce over medium heat until reduced by half. Season to taste and serve over short ribs. Garnish with fresh herbs such as parsley, chervil or lovage. 1. Heat the oil over medium heat, add the garlic, parsley, cabbage and eggplant, next add the lima beans. Add the carrots and chayote – allow to steam until somewhat tender, then add spinach and watercress. Add the chicken broth. 2. Let cook for another 10-20 minutes. 3. Taste, adjust seasonings. Add Maggi cube (optional). 4. Taste again, and adjust all the seasonings. This week on Rocco's Dinner Party, it was a battle of the women, as lone male competitor Daniel Vater only manged to convince Rocco that his food is overwrought and worthy of sending home. The other two competitors, caterer Vanessa and biscotti baker Natalie have to whip up a French-themed dinner party using recipes from Julia Child's Mastering the Art of French Cooking as inspiration. Vanessa, whose parents are from Haiti, decides to work an Island French theme, while Natalie - who is all over the place, one of those crazed Type A personalities - goes for a whorehouse theme. Or that's what it looked like, anyway. Guests this week are Julie and Julia author Julie Powell, comedian Michael Ian Black, model Leah de Wavrin, actress S. Epatha Merkeson, event planner Marcy Blum, and chef Alain Sailhac. Marcy, as luck would have it, is the fish-eating vegetarian of the group so the chefs have to accommodate her dietary restrictions. Natalie goes first and serves chewy gorgonzola-stuffed dates wrapped with prosciutto, bacon onion gnocchi, filet of sole stuffed with duxelles, and a gateau a l'orange. Despite Rocco's original doubts as to her abilities in the kitchen, she fares very well. Vanessa then pulls out a red snapper crudo, an onion and plantain soup, braised short ribs, and a banana tart. In the end, Vanessa reigns supreme and wins the $20,000. 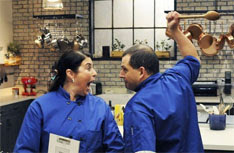 Top Chef Just Desserts Season Two is Coming! 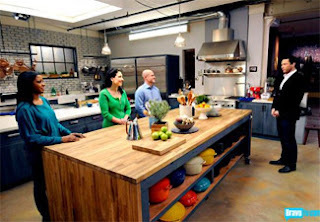 NEW YORK – July 20, 2011 – You can satisfy your sweet tooth without the guilt when Bravo's most delectable series, “Top Chef Just Desserts" returns for a second season on Wednesday, August 24 at 10 p.m. ET/PT. 14 pastry chefs will see if they have what it takes to out bake, out blend and out brulee the competition where the main focus is the Achilles heel of most chefs: desserts. Gail Simmons returns as the host of this highly competitive series showcasing the best of the best in the world of pastry arts. Once again joining the judges' panel as head judge is Johnny Iuzzini, one of the country’s most celebrated and innovative pastry chefs and Executive Pastry Chef at Restaurant Jean Georges. Hubert Keller, critically acclaimed chef as well as guest judge on "Top Chef" and finalist on "Top Chef Masters," and Dannielle Kyrillos, entertaining expert and Contributing Editor of Food Republic will also serve as regular judges for the series. 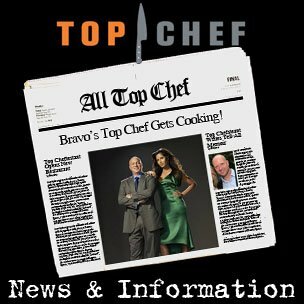 Congratulations to Top Chef for garnering four Emmy nominations (“Outstanding Reality-Competition Program,” “Outstanding Cinematography for Reality Programming,” “Outstanding Directing for Non-Fiction Programming” and “Outstanding Picture Editing for Reality Programming”)! 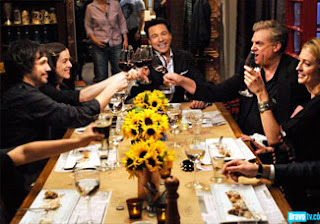 No Reservations, the Travel Channel show starring frequent TC judge Anthony Bourdain, also received four nominations (“Outstanding Nonfiction Series,” “Outstanding Writing for Nonfiction Programming,” “Outstanding Picture Editing for Nonfiction Programming” and “Outstanding Cinamatography for Nonfiction Programming”). In case you missed it, here’s a 30-minute video of Bourdain answering the top 10 questions posed by viewers on Reddit. Want to meet Fabio Viviani? Bertolli olive oil is sponsoring a contest where the winner will win a trip for two to LA for cooking lessons with the maestro. Ruth Reichl confirms here that Top Chef Masters 4 is in the works. Jen Carroll, Spike Mendelsohn, Kevin Sbraga, Dale Talde, Carla Hall and Stephen Asprinio were among the Top Chef alums who showed up for an “oven-warming” party at All-Stars finalist Mike Isabella’s newly opened Graffiato. Check out pics and more on Eater. A couple of interesting pieces about TC Masters 3 finalist Traci des Jardins here and here. She is also blogging for the new Huffington Post San Francisco edition. Here inaugural post here. And Harold Dieterle, Fabio Viviani and Richard Blais will each take over the kitchen at Wisconsin’s Lake of the Torches Resort Casino selected Thursdays in August. 1. Soak dried mushrooms (not the portobello or the chanterelle mushrooms) in water. 2. In a pot add oil and sauté onions and garlic. 3. Add the butter and the portobellos. 4. Drain the soaked mushrooms and add to the pot. 5. Sauté the mushrooms well. 6. Add the flour, thyme and mix well. 7. Deglaze with white wine. 8. Add the vegetable stock and simmer for 30 minutes. 9. Add the cream and return to the simmer for 5 minutes. 10. Lightly blend the mushroom soup. 11. Correct the seasoning to taste and add the chopped parsley. 12. In a sauté pan heat the remaining oil and sauté the chanterelles. 1. Divide the chanterelles equally between 4 soup bowls. 2. Ladle in the soup. Corey Roberts talks about his experience on the Bravo show. A highlight: Chef Corey works for LSG Sky Chefs. If you have traveled on United, Delta, American or just about any other commercial airline, you have probably had a meal from Sky Chefs. 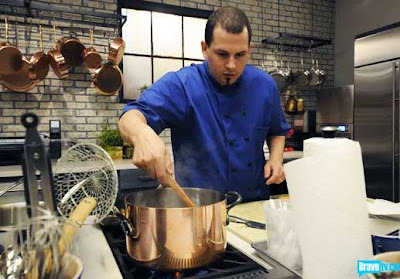 Another dinner party is in the works and to help, Rocco calls in three new chefpetitors. We have vegan food blogger Ayinde, executive chef for LSG Sky Chefs Corey, and cooking school guru Nicole. 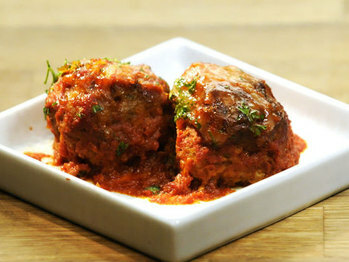 The three whip up their signature dishes in 30 minutes and Rocco passes judgment. Rocco is impressed by Ayinde's ability to make a barbeque seitan that tastes like meat, but he feels that it is agressively overseasoned. Corey's mummy fried shrimp are undercooked and Nicole's pan roasted salmon suffers from an improper use of truffles. In the end, Rocco sends Ayinde packing. The theme for the dinner party is Town and Country. One chef will make a dinner that reflects the simple, rustic flavors of the country while another will emphasize the sophistication of the city. Corey ends up with country and Nicole ends up with town. Decor specialist Jess Gordon is brought in to help them set up their dining rooms. Corey chooses the terrace and asks for old farm pictures on the walls and other rustic accoutrements. Nicole chooses the formal dining room and decides on "New York in Spring" as her theme. Lots of white linen, tulips, and pink pashminas on the table. With $500 each to shop, the two chefs set about putting together their meals. Corey goes a bit overboard with too many options. He bakes bread, offers an entree option of poussin or salmon trout, makes two desserts, and even makes gifts of jam in little jars. Nicole is less ambitious, but goes for sophistication with tuna tartare, risotto cakes with lobster, fennel salad, filet mignon, and flourless chocolate cake covered by spun sugar domes. The party guests start to arrive and the first is Terrance Brennan, chef/owner of Picholine and Artisanal. Since cheese is a big focus at Artisanal, Chef Brennan brings along a selection of cheeses that the chefs must incorporate into one dish. Other guests include Melissa Joan Hart, Mo Rocca, Christian Campbell, Deborah Cox, and ballerina Tiler Peck. Corey's dinner begins and his cheese course is fried cheese with lingonberry jam. Despite Chef Brennan's reservations about fried cheese, he likes the dish. Things seem to be off to a good start, but Corey swiftly falls behind. When Rocco enters the kitchen to see what's going on, Corey abruptly dismisses him. Eventually, Corey gets his complicated menu out to the diners on time. Nicole starts her service and quickly fills the loft with smoke from her grilled lobster. She also neglects to check with the diners about the doneness of their filet mignons, forcing Rocco to take Deborah's steak back because it is very rare and she wants it well done. With all the mishaps over, Rocco weighs his diners' opinions and comes to a decision about the winner. With a toast of champagne, Rocco declares Corey the victor. Now the transplanted Aussie has 20 grand for a big family vacation! What did you think of last night's episode? Comment below. 1. Simmer the chicken meat with the stock until 3/4 of the way cooked. Remove from heat and let cool. When the chicken is cool around room temperature remove from liquid and cut into small dice (reserve liquid for later). 2. Mix the herbs, lemon zest and juice with the yogurt. Add about 1 tablespoon of the cooking liquid to loosen the yogurt if it’s too thick. 3. 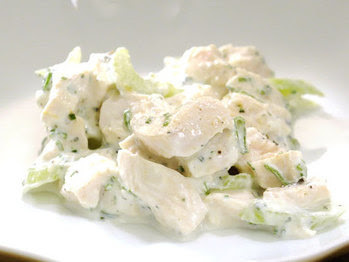 Add the cooled chicken and celery and season with salt and pepper to taste let chill before serving. 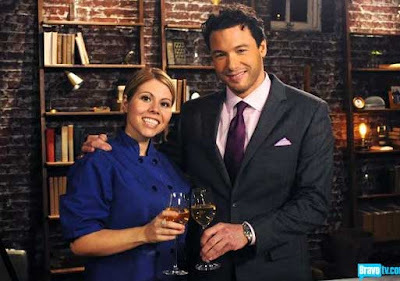 Chef Jen DePalma talks about her experience on "Rocco's Dinner Party." Click here for Jen's Blog. Congratulations to Bryan Voltaggio on the birth of his new daughter! Is brother Michael Voltaggio working on a restaurant in India, while his L.A. restaurant named "Ink." remains unopened? Spike Mendelsoh's Philly expansion of his Good Stuff Eatery chain appears to be dead in the water - er, at least until after 2012 - according to Feast. Top Chef: Just Desserts finalist Danielle Keene has resigned from LA Creamery. And Jamie Lauren is out at Beechwood while Kogi food truck king Roy Choi reportedly takes over the kitchen. In more upbeat news, Season 6 finalist/Fan Favorite Kevin Gillespie, who, compared to many TC competitors, has remained pretty selective about appearances, has made this "30 Under 30" list of "chefs, bloggers, farmers, activists, and educators who are just as passionate about delicious food as they are about its sustainability and safe cultivation." 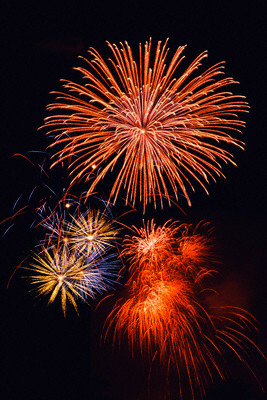 You can, however, catch him at the 2011 Gig Harbor Wine & Food Festival in Washington State August 6. A Top Chef contender who has remained even more under the radar, Season 2's Cliff Crooks (ousted after the infamous head-shaving incident with Marcel Vigneron), may make an appearance on the new season of Gordon Ramsay's "Hell's Kitchen," whose winner is promised the nebulous position of serving as sous under BLT Steak's current executive chef - yep, that would be Cliff. 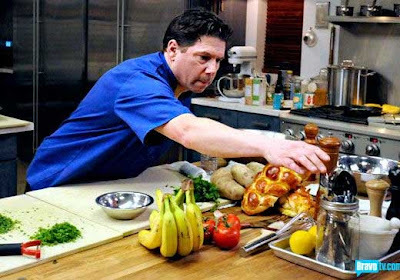 As if the cooking competition reality show genre isn't already glutted, Top Chef producers The Magical Elves have issued a casting call for a "potential" new series for Bravo seeking "adventurous" professional chefs at "all skill levels." Does this mean we'll be spared a second season of Rocco's Dinner Party? Speaking of food reality shows gone awry, here's an insightful update on the demise of the prize offered to the winner of "America's Next Great Restaurant," Jamawn Woods, for his Soul Daddy restaurants, in which Top Chef Masters 3 host Curtis Stone was supposedly an investor. Finally, for your Friday summer reading pleasure, some wickedly funny "fake foodie fan fiction," by Jason Kessler. Curtis Stone is the protagonist in this inaugural installment of "Inside the Stoves" via Eater, featuring "excerpts" from faux books that are a great send-up of food media. I'm looking forward to more! This week, our three chefpetitors were Fabio, Ryan, and Jen. Rocco seemed extra critical of their dishes this week, mostly because he couldn't find all that much wrong with them apart from either too much or not enough seasoning. Fabio got the boot right away and Jen and Ryan went on to cook for the party guests. This week's theme was the Perfect Summer Party, but also Diet Food, which nobody wants at a party. But Rocco had to have a tie-in with his book, Now Eat This! Diet, copies of which he generously presented to the chefs. Each of them had to prepare three courses and a cocktail, the food needing to have less than 350 calories and 10 grams of fat. Ryan chooses to make three dishes that he's made before, all of which seem really diet-y - scallops with a tomato watermelon salad, black cod with edamame and cucumber, and Greek yogurt with balsamic strawberries. Jen makes a more adventurous menu, with scallops in a tequila sauce with avocado puree, bbq pork tenderloin with rice and beans, and a passionfruit trifle. The guests arrive and include actor Chazz Palminteri and comedian Jeff Ross, plus a bunch of fitness people. Yawn. Ross decides he doesn't want to eat diet food, so Rocco takes him into the kitchen to make special requests that include chicken salad, matzo brei with salami, and cheesecake. The chefs are all WTF? but Ryan takes the chicken salad and Jen the matzo dish, both of which still need to meet the 350/10 criteria. Ryan serves first and generally his dishes go over well, although his cod doesn't excite too many people. Jen's dishes fare better, but her bbq sauce is a bit too much like ketchup. However, her matzo brei is stunningly good, which gives her the edge in the competition. Rocco declares Jen the winner, which is a surprise to all because, well, she's female. And it doesn't seem like the female chefs have been particularly favored in this competition. What did you think? Please leave a comment! Hungry for Top Chef 9? 1. Put milk and bread in a mixing bowl, and let the bread absorb the milk. 2. In a mixing bowl, add meat, eggs, parmesan cheese, parsley, salt, pepper, and the bread (squeeze out the milk before adding). 3. Mix together and create 16 mini polpettine. 4. In a large pan, add the oil and seared one side of the mini polpettine for a few minutes, turn up side down the polpettine and add the tomato sauce. 5. Cover and cook for 5 min a slow fire serve with some parmesan on top. 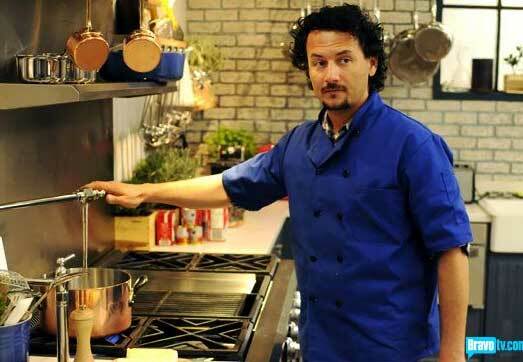 Chef Fabrizio Carro talks about his experience on the Bravo show. Click here for the Quattro Website.